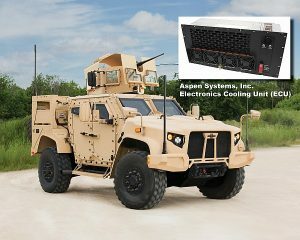 Aspen Systems announced today that they are supplying Environmental Control Units (ECU’s) for critical communications electronics cooling for the Joint Light Tactical Vehicles (JLTV) being produced by Oshkosh Corporation. The first vehicle order under this contract was released by the Army on March 23, 2016 for 657 vehicles. The initial JLTV production contract calls for a delivery total of nearly 17,000 vehicles, while the total program is expected to result in over 50,000 JLTVs delivered to the US Military. Aspen’s miniature vapor compression environmental control units have been successfully deployed on the SOCOM MRAP’s. These ECU’s are used to cool electronics mounted outside the passenger cabin in the rear of the vehicle. In addition to providing 550 Watts of cooling, the system also provides up to 300 Watts of heating for temperature and humidity control for critical communications systems. These ECU’s are 5 times lighter, 4 times more energy efficient, and half the size of thermoelectric based systems. “Aspen’s miniature cooling technology is smaller, lighter, and more efficient than competing systems”, said Glenn Deming, Aspen Systems VP and GM. “We are proud to supply these ECU’s in support of an important program like JLTV.” Similar systems were first utilized by the WIN-T program in 2010. Since that time Aspen has shipped over 2300 systems to DOD and around the world.